Content and context matter the most today, isn’t it? Before you proceed, can I request you to pause for few seconds and think about the last advertisement you clicked on any digital channel —just anywhere, any ad? Before writing this post, I carried out this check multiple times and more often than not, I observed myself clicking on sponsored posts only if they were very appealing visually or the initial blurb looked emotional or entertaining or had the specific information I’d tried to find recently. In a nutshell, it’s the content and context that made me click. I am sure, it’s the similar trigger for many of you. There’s nothing new in this; since ages it’s the content and context that have been working for marketing but in this current era of digital excess and content overload, these are the only two things that matter the most – great content and right context! You might be having great content but if you haven’t figured out the right channel and the right time to deliver your content, it’s gone. And same would be true vice versa, a perfectly planned campaign with the right audience segmentation is of no use unless you have content that can attract and connect with your audience. While almost everyone is aware of the value of good content and context but the truth is, very few focus on the these holistically. Content is a lot more than beautiful visuals or infographics and context is much more than just geo-targeting or re-marketing. One of the most fundamental definitions of context marketing is, “delivering the right content, to the right people, at the right time.” Sounds simple, doesn’t it? However, the more data we have about our user, the complex it gets to do contextual marketing. There are many framework and tools available that you can use to plan your content marketing but for context marketing, it’s evolving every day, simply because the algorithms and engagement level at each channel are changing at a very dynamic pace. Who? 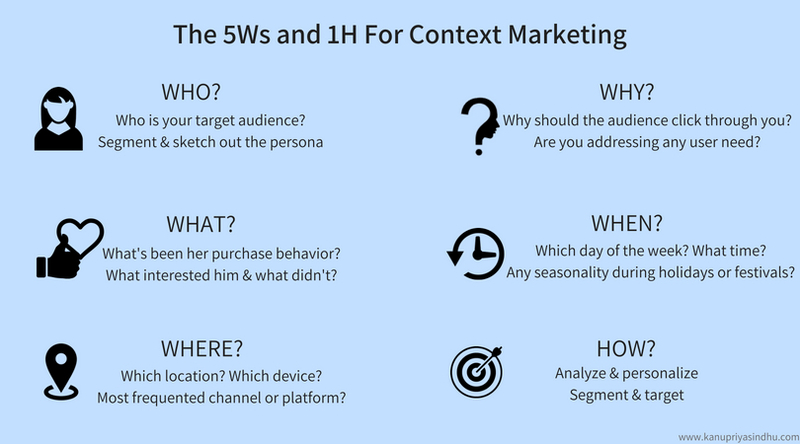 : Like any other kind of marketing, setting up a context starts with “WHO”. Who is your audience? What’s his/her personality? How would you describe him/her? Sketch out the “who” part using any good persona template. The clearer you are about the “who” part of your target, the easier it would be to plan out your marketing campaigns. Why? : Once you’ve defined your audience, it’s extremely important to address the “WHY”. “Why” should your audience notice you or click through you? If you don’t have a “why”, it’s highly unlikely that your audience will have a “why” to click through your content. Have a purpose and address your user’s needs. As long as you provide answers to their needs, they will always have a reason to be attracted and engaged with you. What? : Delve deep into your audience’s behavior and you will get the answers to your “WHAT”s. What has been the purchase behavior of your audience? What kind of campaign interested them? What kind of campaigns escaped their notice? What are his interests, what stage of buying cycle is she at? The more you are aware of what interests him/her, the more contextual you can be. When? : Earlier, the “WHEN” part was the simplest of all to define. Not anymore. In this multi-screen, hyper-connected age, this is the trickiest to define. Your audience could actually be looking out for you almost anytime, anywhere. Do some data digging and figure out if there is any “when” trend that exists, like, what time of the day, which day of the week, any seasonality during holidays or festivals etc. Where? : “WHERE” forms a very important part of contextual targeting, from location to devices, from channels to platforms, know your user’s preferences and target them accordingly. How? : And the last bit, “HOW” to do contextual marketing? Well, as long as we have the answer of all Ws and, then if we merge the demographics with behavior and needs, we can target the right audience, with the right messages, at the right time. A detailed post on “how” to do contextual marketing is coming up soon as the second part of this post. Till then, I’d love to know more about your favorite tools and framework for context marketing. If you found this post interesting, it would mean a lot to me if you could click on the “like” button below to let me know. Thank you!